If Biking in DC Is So Easy, Why Don’t More People Do It? It’s morning in the nation’s capital, and Union Station spits out a constant line of suits. Meanwhile, the self-chosen few cruise by on their bikes. Two cyclists died on D.C. roads this summer, one just blocks from the Capitol. But those who pedal to the Hill say it’s still the best way to get around — with bike lanes on popular routes, plentiful rack space and security everywhere watching your ride. “The idea of locking it up behind the United States Senate across the street from a Capitol Police guard post, I feel pretty safe,” Senate Armed Services staff director Christian Brose said. “For me it is literally faster to get to the office on my bicycle than any other way I could do it. I can beat a car. I can beat an Uber. When it’s cold, it’s only cold for a few minutes,” he added. He’s part of an exclusive club, at least for now. He’s never had problems finding a place to park, whether it’s inside the Senate garages or outside in the elements. On the House side, staffers recommend getting to work by 9 a.m. to find a prime spot. It’s not exactly a community where everyone knows your name — but they may know your drivetrain. While the two-way route in the median of Pennsylvania Avenue — first added in 2010 — does the trick for some, others complain that it’s one of the few protected lanes in the city. Then there’s the Washington weather, and it’s not just the back-sweat-inducing highs of summer. “The trickier thing is biking in the snow and the ice and everything like that. You can definitely detect the seasoned riders,” Brose said. To get business-ready, some hit the showers. 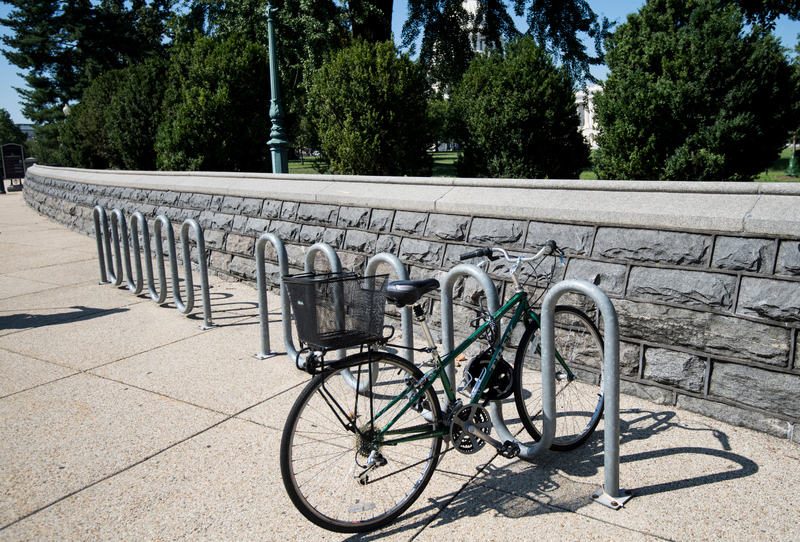 “The House has done a good job of putting bike racks pretty close to the fitness center,” a staffer said. He co-chairs the 130-member Congressional Bike Caucus, which organizes a free maintenance clinic for staffers each spring. Citing a disproportionate increase in cyclist deaths nationwide, Blumenauer re-introduced his Vision Zero Act, which would authorize the Department of Transportation to award grants to a city — like D.C. — to cut down on traffic fatalities. That bill is unlikely to get anywhere. The pair of summer deaths in D.C. shook the biking community. Blocks from the Capitol, Malik Habib was struck by a tour bus in June after his bike got stuck in the H Street streetcar tracks, NBC reported. And in July, Jeffrey Hammond Long was hit by a delivery truck at the intersection of M Street and New Hampshire Avenue in Northwest. D.C. has since removed four parking spaces to improve visibility at that intersection, WUMA reported. On the Hill, small improvements are afoot. Since March 2017, representatives from the Office of the Sergeant at Arms, Senate Parking Operations, House Parking Security and the Architect of the Capitol have served on a cross-campus Bicycle and Pedestrian Safety Taskforce. They’re working to address lighting and visibility concerns along Northwest and Southwest Drives, according to a Senate Sergeant-at-Arms notice sent in August. What’s next? No word from the Sergeant-at-Arms.